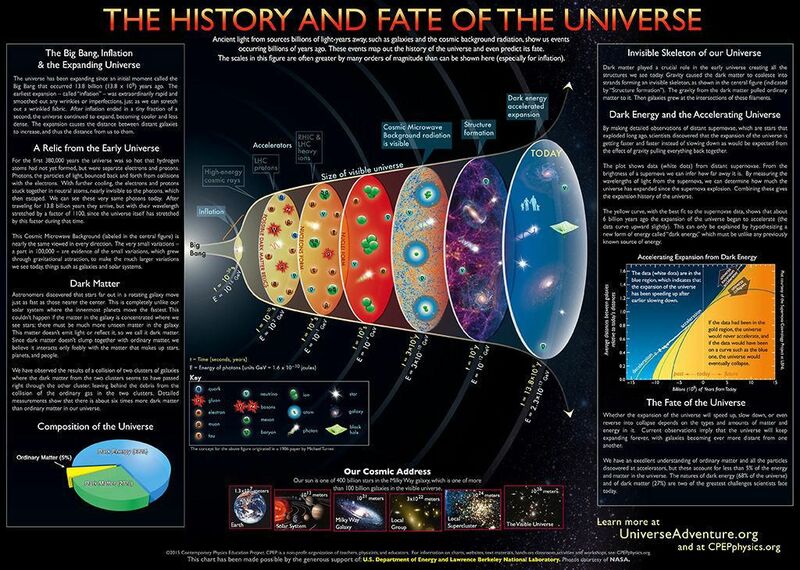 This colorful, graphically rich chart illustrates and summarizes what is now known about the history and fate of the universe. 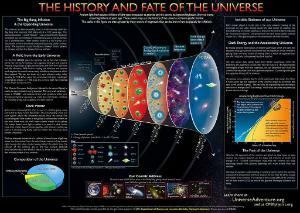 Developed by scientists at the Lawrence Berkeley National Laboratory (Berkeley Lab) in collaboration with the Contemporary Physics Education Project (CPEP) and George Smoot, Nobel prize winner for 2006, the chart is crammed with information covering a broad range of cosmological topics. The centerpiece is an evolutionary timeline that takes viewers from 10-44 seconds, when the universe was much smaller than a proton, to the current era, about 14 billion years later, when the visible universe contains 4 x 1011 billion galaxies. Side panels provide short discussions on the birth, inflation and expansion of the universe, the cosmic microwave background and redshifts of distant supernovas.